Reuben Hallam is my husband's great-great-grandfather. I am looking for information about the artist W. Lindley. The collection has very little information on this artist, and would be happy to find out more. Mr. W. Lindley appears to have been active in the 1890s. He attended the inaugural meeting of the Sheffield Art Society and Sketching Club which was held in January 1895, and was elected to the committee. He subsequently presided at some of the monthly meetings of the Society where members exhibited their works. In August 1896, 40 works were exhibited including 3 large oils by W Lindley "executed in his usual sober and truthful style." How sure is the collection that the work is by W Lindley? I ask as in August 1888, at an exhibition by the Society of Artists, a portrait of Reuben Hallam was displayed, the work of Willis Eadon. This information would make Willis Eadon 18 years old at the time of the exhibition. I wonder if there are any other portraits of Reuben Hallam, or any other information regarding this interesting gentleman. I went to view his work The Adventures Of Wadsley Jack held at the Sheffield Central Library, a great read once you get the hand of the dialect. It's not entirely impossible that this could be the work of an eighteen-year old artist. Please could the collection confirm the source of the attribution to W. Lindley and the date of 1888. Perhaps there are inscriptions on the reverse -- an image of which would be helpful. Please could the collection also check and confirm the size of the painting. The measurements given (95.3 x 54.9 cm) suggest a canvas almost one metre high: if these are correct, the head would be painted on an over-lifesize scale. The Census records reveals the various occupations undertaken by Reuben Hallam. 1861 and 1871 records him as a Spring Knife cutler. 1881 he (and 3 of his children) declare themselves to be artists. 1901 he has returned to his trade as a spring knife cutler. I recommend that you search on-line newspaper archives for his name. It occurs many times and in various circumstances. So it is not surprising that by the time his portrait was exhibited in 1888, he was described as a "local celebrity". Even on the ordinary Art UK image - tweaked a bit - the signature and date, which are in the bottom left corner, can be seen fairly clearly. It does seem to be 1888 (or possibly '85); and although the name is not quite so clear, it looks much more like 'W. Lindley' than 'W. Eadon'. See attached 1. Assuming the date is indeed 1888, the coincidence of another portrait exhibited the same year might lead one to suspect a mistake by the reporter. 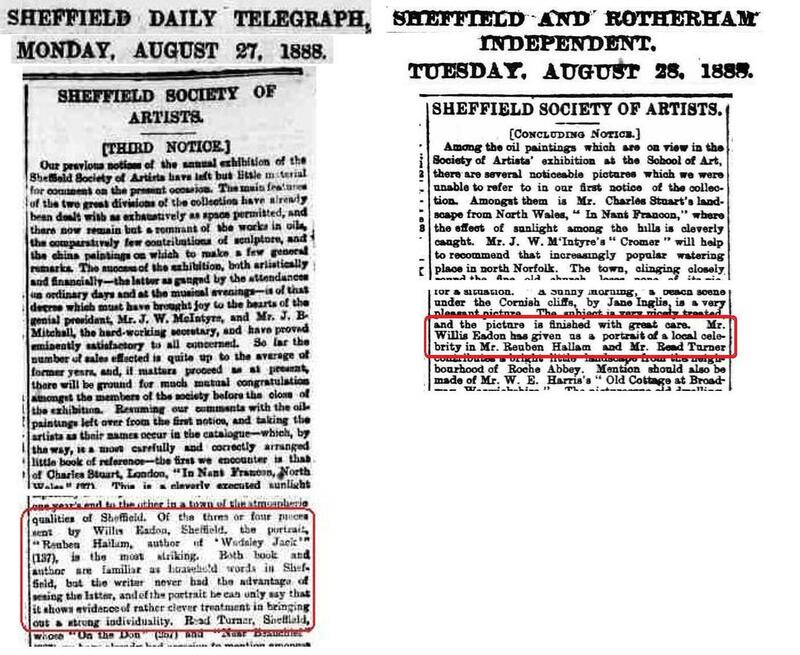 But in fact two different newspapers ascribe the exhibited work to Eadon (see attached 2); and of course with the publication of 'Wadsley Jack', 1888 was probably the peak of Hallam's fame - so it's not unlikely that more than one artist wanted to painted him. Although probably no longer relevant to the painting under discussion, I should point out that the dates of 1870-1945 given for Eadon everywhere (including Art UK) are wrong: http://bit.ly/2nnZtMV & http://bit.ly/2o7L5FL . There are two or three different Willis Eadons who lived and/or were born locally in the right period, along with the odd Willy/Willie...but none of them was either born in 1870 or died in 1945! Lest there be any doubt, the attached confirms that the Willis Eadon who was buried at Baslow in 1948 was the Sheffield artist, and also explains what happened to the two young people also on the memorial. We can tell that W Lindley was an amateur artist from his membership of local art clubs. In Sheffield, professional artists were members of the Society of Artists. Amateur artists joined the other clubs in the city. Lindley was a member of the Surrey Art Club, which subsequently evolved into the Sheffield Art Society and Sketching Club. The artist is perhaps the William Lindley born in 1858 whose death in 1903 was recorded in the Eccleshall Bierlow, Yorkshire, registration district and (presumably the same man) whose burial in the Wadsley, Yorkshire, registration district was recorded also in 1903. Please could the collection check and confirm the size of the painting. 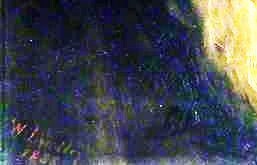 The measurements given (95.3 x 54.9 cm) suggest a canvas at variance in its height-to-width proportion with the somewhat squarer image we see here. Moreover, if the canvas is indeed almost one metre high, then the head would be painted on a considerably over-lifesize scale. Reuben Hallam was certainly an artist himself. As a child I saw a receipt made out to him for a painting he had done for the Duke of Rutland, the receipt was from Belvoir Castle but the Rutlands also owned Haddon Hall near Sheffield. Unfortunately the receipt was lost when my grandfather died. We have adjusted our records accordingly. These changes will be visible on Art UK in due course. William Lindley (1857–1903), amateur artist who was a member of the Surrey Art Club, Sheffield, which in 1895 evolved into the Sheffield Art Society and Sketching Club, when he became a member of its commitee and continued exhibiting with it. Lindley appears to have been born in Sheffield in March 1857, the elder son of a Britannia-metal smith, which the 1881 and 1891 censuses show was also his profession.He was buried at Wadsley, Yorkshire, in 1903. Willis Eadon (1863–1948), artist, born at Sheffield on 14 September 1863, the son of John Eadon a cutlery manufacturer. In 1891 he was a school teacher living in outer south Sheffield (technically Derbyshire), but by 1901 had become an 'artist and photo engraver', as he was also in 1911. In 1909 he was on the Selecting/Hanging Committee of the Sheffield Society of Artists, and he is listed as an artist in Sheffield directories from 1901 until at least 1920. He later moved to the Derbyshire Peak District and died there on 21 January 1948, followed on the 28th by his wife Frances.They are buried at St Anne's, Baslow, where their substantial monument also commemorates their elder son Eric (b. 1900 ) and the latter’s fiancee Winifred Swinden. Both are also buried there, having died after the former’s motor-cycle collided with a coach in moorland fog in the summer of 1923. With thanks to all who have contributed information so far on Lindley, Hallam and Eadon, to the collection for correcting the measurements and to Pieter for his summary, I think we are close to terminating this discussion. However, I suggest we need cautionary question marks qualifying Lindley's dates and possibly even his forename. As far as I can see, it is not absolutely certain that the artist's first name was William, although this seems likely. It is also highly probable that our artist was the William Lindley whose death in 1903 was recorded in Eccleshall Bierlow, Yorkshire, and whose burial on 3 February 1903 was recorded in Wadsley, Yorkshire -- Wadsley, of course, tying in neatly with the titles of Reuben Hallam's 'Wadsley Jack' publications and, arguably, being more than chance coincidence. However, both the death and burial records give that William Lindley's birth year as 1858 -- not 1857. The 1881 census also gives 1858 as the birth year for the William Lindley who was recorded as a 'Brittania Mettlesmith (White Met)', living at 69 Woodside Lane, Brightside Bierlow. The above said, William Lindley seems to have been a very common name in and around Sheffield at the time. For example there was a William Lindley born in Sheffield in 1836 who died there also in 1903. In brief, it might wise to record the artist's details in the form 'W. (?William) Lindley (?1858-?1903)', retaining the date of 1888 for the work, in which year Hallam would have been 70, which seems about right.